WHEN: Saturday, September 11, 10 a.m. - 7 p.m.
Sunday, September 12, 10 a.m. - 5 p.m.
Alexandria, VA - Alexandria&apos;s premier art affair returns for its 8th anniversary September 11 - 12, 2010. For two days King Street from Washington Street to the waterfront is transformed into an outdoor art gallery with original fine artwork by 226 artists from 30 states and 20 countries. Festival-goers will be treated to paintings, life size sculptures, photography, glass, wood, jewelry, collage and ceramics with prices ranging from $25 hand-designed earrings to $20,000 metal sculptures. New this year the "Alexandria Art Experience" joins the festival on Saturday. Alexandria artists are among the troupe of national and international artists presenting work at this highly anticipated fine art show; including Torpedo Factory artists Matthew Johnston and David Cochran as well as local favorites Pat Palermino and Jane Andrle Gillette. Admission to the festival is free and open to the public. The Art League and the Torpedo Factory Art Center are teaming up for the "Alexandria Art Experience," a special new local village at the Art Festival. Through activities, an artist demonstration, and a fun ceramics fundraiser these tents will share the enriching experience of the arts community in Alexandria. Hands-On Activities and Artist Demo. The Art League will present a dynamic hands-on activity for kids and adults in the morning from 10 a.m. to 12 noon, followed by a plein-air painting demonstration from 2 to 4 p.m., and a sketch book activity throughout the afternoon. Button Art. The Torpedo Factory Art Center will hand out components for a button badge that can be designed collage-style. Participants will bring their badge components to the Torpedo Factory on the waterfront to collect a variety of colorful bits and create their own piece of flair. The Torpedo Factory activity goes from 11 a.m. to 4 p.m. and coincides with their annual event Art Activated, held at the Art Center from 12 noon to 4 p.m.
Ice Cream Bowl Fundraiser. From 12 to 4 p.m. the Ice Cream Bowl Fundraiser supporting The Art League Ceramics Department presents a delicious way to support the arts. $15 includes the selection of a unique handmade ceramic bowl created by the talented artists of The Art League&apos;s Ceramics Department and a bowl of artisan ice cream from ACKC Cocoa Bar of Alexandria&apos;s Del Ray neighborhood. Participants in the Ice Cream Bowl Fundraiser may enter a free drawing to win an Art League gift certificate. Visitors from around the corner or around the world can enter to win an Artful Getaway to Alexandria! 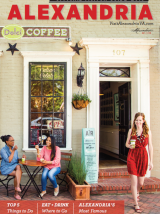 Alexandria was voted Third Best Arts Destination Among Mid-Size Cities by AmericanStyle magazine readers, and this giveaway will award five lucky winners a fun, free way to experience this accolade first-hand. Five prize packages include overnight stays at top Alexandria hotels, gift certificates and experiences from the Torpedo Factory Art Center and The Art League, and gift certificates for dinners at local restaurants. Art lovers can enter online at VisitAlexandriaVA.com, or entry can be made in person during the Art Festival at the information booth near Market Square or at the Alexandria Visitors Center at 221 King Street. Step inside from the street fair and let your creative side play at this 4th annual event. Artists will demonstrate pottery on the wheel, painting, sculpture and much more. Try your hand at screen printing, bubble gum painting, pottery on the wheel and the popular champagne cork chairs workshop. Don&apos;t miss a hip hop fusion performance by DCypher Dance. The SnackShak by Bittersweet will offer a Torpedo Factory inspired cupcake creation and other goodies available for purchase. Historic Christ Church presents family friendly activities, rest area and moon bounce.